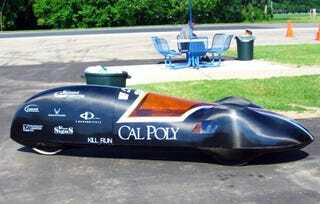 Engineering students at the California Polytechnic State University are showing off the updated Black Widow, their entry for the upcoming Shell Eco-Marathon contest, and it involves some unusual numbers: 3 (wheels); 3 (horsepower engine); and 2,752 (miles per gallon). The team has been working on the vehicle since 2005, and with each successive year they've managed to shed weight and ramp up mileage. In its current state it weighs only 96 pounds, and can hit a top speed of 30 MPH with its Honda 50cc engine. In the last three Shell Eco-Marathons—a competition for student-made, energy-efficient vehicles—the Black Widow placed either first or second. The competition takes place at the end of March, and this year the California Polytechnic State team will double its chances by entering a second vehicle, also with three wheels, in the Urban Concept category.